The back door was open as I sat at our dining room table. Sirius slept on the floor nearby and the house was quiet except for the tippity-tapping of my keyboard. Then there was a sudden fluttering by my hand, so impossibly silent that I thought I'd imagined it. Glancing up, I saw that a bird had gotten off track and found its way into our home. It darted over to the windows of our little kitchen alcove. I watched, fascinated by this tiny creature. 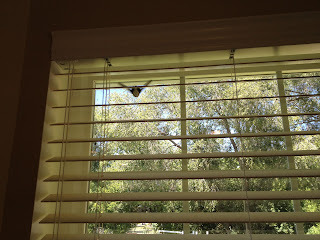 It was not just a bird, but a hummingbird, and hummingbirds are amazing. I approached hesitantly, not wanting to frighten him, and stood watching as he glided along the glass surface, bumping it gently in his quest for the out-of-doors. 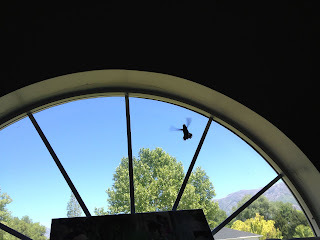 He fluttered back and forth within the bounds of the window frame as I started snapping pictures -- first from a distance, then gradually closer. He was clearly out of his element, lost and confused. I was feeling a bit similarly, wanting to help this unfamiliar guest and not knowing how. I opened the nearby window and took out the screen, placing a piece of mango peel on the sill in case that might draw his attention. Then, very carefully, I raised the blinds. Fascinated, and uncertain what else to do, I drew closer yet -- so close, in fact, that I could feel the air beneath his tiny wings as he hovered just inches away. 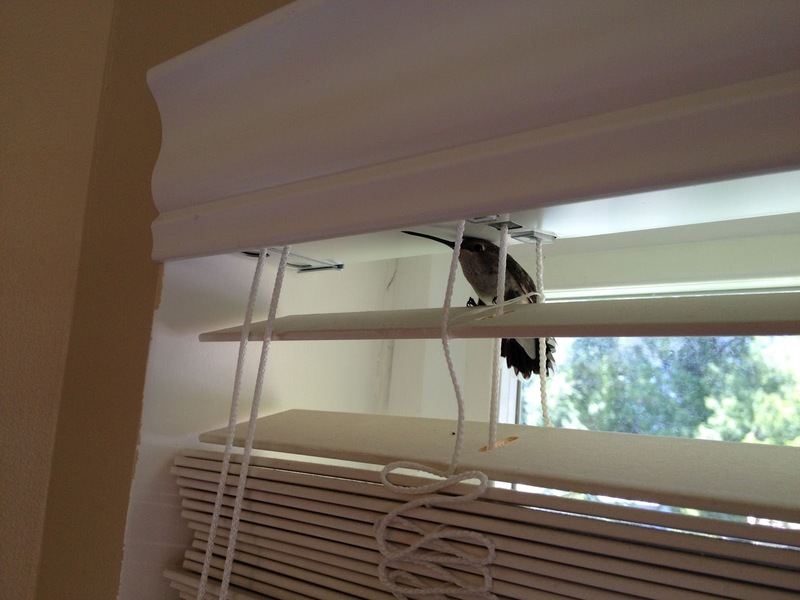 He settled eventually onto the top of the blinds and rested there awhile. We regarded each other, each perched steadily on two feet. When he finally came out from that window space, he did not go through the open window nearby nor through the still-open door, but instead ascended to the ceiling and followed its sloped contours to the far wall, to yet another window. He continued his flight awhile, nudging the glass in his ongoing search for the bigger sky, before coming to rest, his tiny body beautifully balanced on the top edge of an open booklet. I was intrigued. Like a small child, I found myself asking Can I keep him? The answer, of course, was no. This tiny creature belonged outside, and would need to soon be on his way toward his next sustaining meal. Slowly, gently, I placed a box over his body and a temporary cardboard floor beneath his feet, then released him out on the deck. 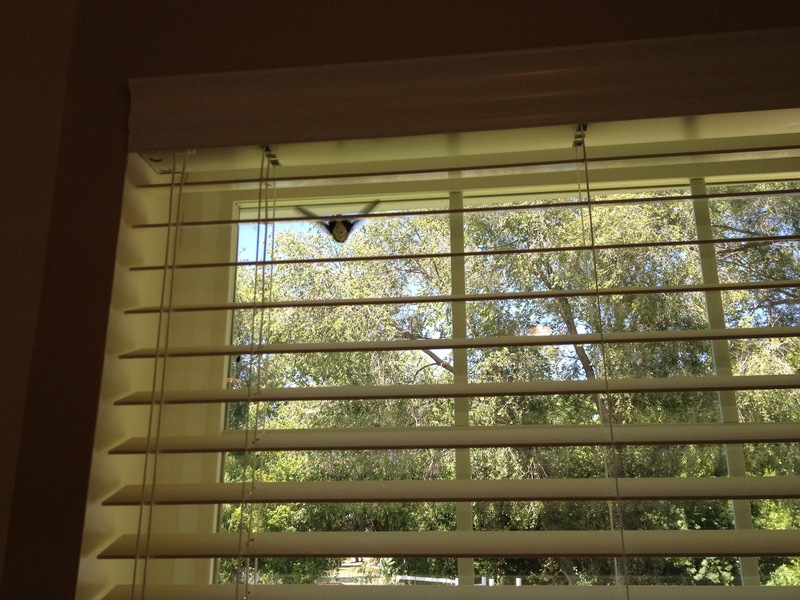 He flew quickly away, finally unhindered by the transparent confusion of glass. I was appreciative of the encounter, and glad also that he was returning to his natural home. I've been thinking about this feathered fellow for several weeks now. 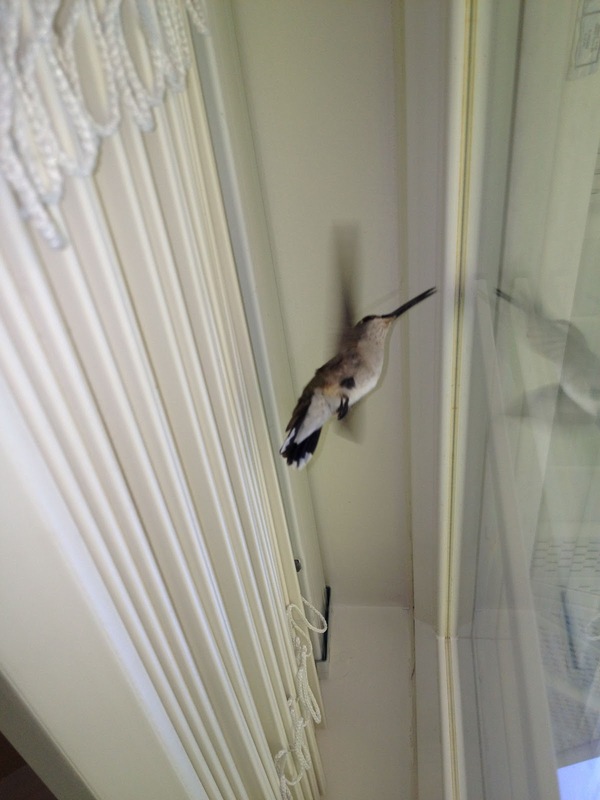 He was an experienced hummingbird, probably quite competent under the usual circumstances of his life. But when he found himself in a new situation, he couldn't seem to get past his own assumptions; the directly skyward orientation which probably serves well on other days simply did not work inside the house. He needed a little help from someone with a broader view and an outside perspective, and he needed that help to be not just informationally accurate, but sensitive and gentle, respectful of his situation and of his nature. And doesn't that describe us pretty well in humanity, too? We learn and grow, developing understanding and skills to become generally able to respond to much of what life throws our way. Sometimes, though, we find ourselves in situations where the usual responses don't work; we get stuck, and stuck further by assumptions which have become so ingrained in us that we don't even realize they're there. At such times, the engaged presence of a friend with broader view and outside perspective, offered with sensitivity and respect, can be a tremendous gift.